Each icon is 64x64 pixels. All have agreed to release these CC0 (Public Domain) to match the license originally chosen by Blarumyrran for the previous icons. Created for Flare. The style is intended to be basically compatible with Wesnoth. Extension of the OSARE weapon icons submission. Not required, but you may choose to credit the collaborators listed in the Description. you know your armor isnt that good when you go out to the battlefield with flipflops. hehe. these are great btw. the flipflops did make me laugh though. Those look excellent a very nice job indeed. As Red mentioned Ill try to make some variations as soon as I have the time. Congrats! This was considered "Really Useful" and added to the RUA-collection! Only the most useful art submissions are marked as such. Could you distribute a version of the art that uses a transparent background. This would make it easier to use. Alternatively the XCF or PSD file. I just uploaded larger (128px) versions with transparent backgrounds, of the cloth icons that I created. Hope thats helpful. 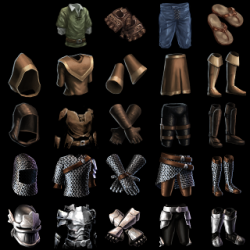 Just to let you know that I used these great armor icons in my upcoming iOS game Dungeon Plunder ( http://dungeonplunder.com ) and you will be credited for this contribution. Thanks. I did this for my project but I wanted to do it for everybody else too. Merry Christmas! Wow, this is very generous to release such quality work as public domain! I plan on using them in my jewelhunt game, thanks a lot for the great work! Thank you, your art helped me alot.